Peter LIEBERSON: Drala (1986); Concerto for Four Groups of Instruments (1972-73); Accordance (1975-76); Three Songs (1981); Ziji (1987); Raising the Gaze (1988); Fire (1994-95); Free and Easy Wanderer (1998). Rosemary Hardy (sop. ); The Cleveland Orchestra, ASKO Ensemble, London Sinfonietta, Oliver Knussen (cond.). DG 457 606-2 (http://www.deutschegrammophon.com/20.21/). In his notes to this splendid disc, Lieberson labels this collection a “snapshot autobiography.” We get crisp and clear — and a tad severe — performances of eight works spanning 26 years. Drala, the magnificent opener, is what makes this release a winner. The large orchestral work opens softly and speculatively (“Invocation”), as if the music is peeking out from behind the curtain on opening night. The lunge into the first movement proper (“Gathering”) is sudden and exciting. Lieberson’s expert orchestral writing takes its place alongside equally meaty scores by Carter, Rochberg, and Henze. The fluidity of a rhapsodic cello solo in the second movement (“Offerings and Praises”) suggests the luxuriance of Berg, and the last movement (“Raising Windhorse”), with bits of a moto perpetuo and prominent percussion, is a whirlwind showstopper. Drala is one of the best orchestral works of the 1980s and should be brought into every respectable orchestra’s repertoire. The Concerto for Four Groups of Instruments is the program’s oldest piece. It demonstrates Lieberson’s total absorption of serialism but lacks the vibrant style and personality of later works. There is a moment in the Concerto (around 4:12) where the instruments create chords by holding notes where, suddenly, we’re transported to the Farben movement of Schoenberg’s Five Pieces for Orchestra, Op. 16. But I wouldn’t characterize this passing reference as a quote for quote’s sake. 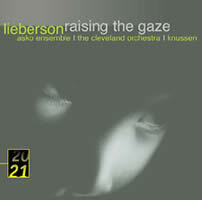 Lieberson possesses one of the most secure musical personalities of any composer working today. In the perky, sunny Accordance, Lieberson moved beyond the Concerto’s pointillistic style into a freer and more harmonic use of serialism. The piece is rich with sustained lines, chords and repeated notes, and the vibraphone and piano’s bright jazziness makes me think that Torke must have heard this and absorbed its spirit. Three Songs are short and mellow settings of poems by Douglas Penick. Ziji means “brilliance, rejoicing — the energy of confidence,” and is a suitably buoyant chamber piece for the unique combination of clarinet, horn, string trio (violin, viola, cello) and piano. Lieberson reminds us that the horn is an agile instrument. Like Ziji, Raising the Gaze is also for chamber-sized forces. The writing is so confident and colorful that you would never suspect the composer’s serial roots. It’s not that serial music implies a certain sort of dullness but rather that few composers are good enough to treat serialism as they would any other technique to help write distinctive and musically convincing pieces. The disc closes with works for larger forces. Fire is a fanfare for large orchestra, part of a not-yet-complete set of pieces based on the Tibetan concept of the five great elements: earth, water, fire, air, and space. At under four minutes, it is a compact showpiece. Free and Easy Wanderer, for chamber orchestra, recalls the abstraction of the Concerto but is constructed like a string of postcards from an exotic place. The work that brought Lieberson overnight recognition was his muscular Piano Concerto of 1983. Commissioned by the Boston Symphony Orchestra for its centennial, the Concerto was first performed with Peter Serkin and the BSO under Seiji Ozawa, both of whom recorded it for New World Records [325–2]. Lieberson’s connection to serialism’s academic aspect is not far off, yet there’s much in the Concerto’s orchestration and flow suggestive of Stravinsky, particularly in some of the first movement’s fanfares. Lieberson definitely demands attention. Oliver Knussen has extracted precise performances from some of the best groups around, the Cleveland Orchestra, London Sinfonietta, and the smaller ASKO Ensemble. DG has done well to include Lieberson in its 20/21 series. Ingvar LIDHOLM: Poesis (1963); Greetings from an Old World (1976); stund, när ditt inre (1998); Kontakion (1978). 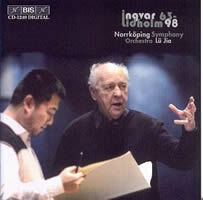 Norrköping Symphony Orchestra, Lü Jia (cond.). BIS 1240 (http://www.bis.se/). Distributed in the US by Qualiton (http://www.qualiton.com/). The Norrköping Symphony Orchestra gives a serious and competent performance of Poesis, though I sense that the orchestra isn’t sure what to make of its truckload of 1960s avant-gardisms. The notes allude to the premiering orchestra’s similar consternation, and while times have changed, it sounds as if this orchestra plays the aleatoric and chance sections dryly and conservatively. A solo piano frequently emerges from the texture and splashes out fistfuls of chords here and a Gershwin-inspired cadenza there. There’s also a lone double bass the booklet labels “grotesquely pathetic.” I don’t know what grotesquely pathetic means, but I do hear a lengthy double bass solo in a high register with glissandos. Nonetheless, Poesis is interesting, and even if Lidholm was bending with the times, he used his tools to craft a meaningful essay. As to the work’s purport, the composer says, “Many people have come and asked what Poesis is about. I don’t know. And I cannot formulate a programme after the event. For me it was merely a matter of composing a piece of music.” I have trouble believing that this work really is no more than an inventory of ways to freak out an orchestra. The composition ends with a single pitch that changes timbre as it is tossed from one orchestral family to another. If it had microtonal inflection or some octave doubling to strengthen overtones then we’d be in Scelsi or Grisey territory, but we’re in the hands of a competent and adventurous Swede. .” Greetings from an Old World and Kontakion are easier to grasp. Both pieces briefly touch upon folk material. The emotional center of Kontakion is an extended bassoon solo sounding lonely and forlorn in its highest register. At the end, a solo trumpet takes up a Russian Orthodox hymn for the dead, the piece’s musical source. Greetings from an Old World was commissioned for the American bicentennial. It dispenses with the idea of jubilation and celebration, and seems to say that life is hard whether in the new or old world and we shouldn’t forget what our ancestors went through. This is dark and gripping stuff. Except for Poesis, the Norrköping Symphony Orchestra under Lü Jia fully commits itself to Lidholm’s passionate and intense aesthetic. BIS has hinted at future volumes of Lidholm’s music. I am hooked. 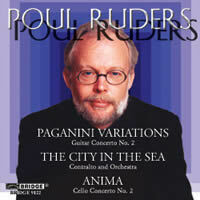 Poul RUDERS: Guitar Concerto No. 2, “Paganini Variations,” (1999–2000); The City in the Sea (1990); Cello Concerto No. 2, “Anima” (1993). David Starobin (guitar); Mette Ejsing (contralto); Michaela Fukacova (cello); Odense Symphony Orchestra, Jan Wagner (cond.). Bridge 9122 (http://www.bridgerecords.com/). The first time I popped this Bridge disc into the CD player, I listened to the Guitar Concerto three times in a row. Ruders’ second for the instrument, a fast-flowing set of 22 variations on the theme of Paganini’s 24th Caprice for Violin, is bewitching. Part of the fun lies in picking out echoes of the other variation sets spawned by this theme, via Brahms, Rachmaninov, Lutoslawski and of course Paganini. But these Paganini variations are foremost a guitar concerto, with the soloist taking center stage. The production puts guitarist David Starobin on top of the action. Some variations are finger-busting (1, 6 and 11), and Starobin tackles them with ease and finesse. Other variations are leisurely and melodic (14 and 20). In variation 14, I hear hints of the slow movement of one of the popular Vivaldi mandolin concertos along with that most famous of Rachmaninov’s Paganini Variations. Variation 20 is especially eerie with its quiet, languid, high accompaniment. The guitar is a delicate instrument easily swallowed up by an orchestra. Further, composers have to be cautious if they choose to approach the ethnic sound Rodrigo ran into the ground. Ruders avoids all that, even though the initial theme statement with trumpet and chimes comes close. Fascinating colors appear when other instruments double the guitar, as in variation 5, where the soloist blends cleverly with the winds, sounding electric for a brief moment. Because Paganini’s theme is so familiar, the work is easy to follow. Now and again a variation (9 and 19) will poke fun at the original theme or its chord progression. The Guitar Concerto is characteristically witty and detailed, but miles away from this disc’s companions, which are perhaps more typical of Ruders: earnest and precise. An appealing, lighthearted work like Four Dances in One Movement (BIS 720) ends up dark and lonesome. Among Ruders’ more lauded works, the Second Symphony (dacapo 224125) requires concentrated attention. Likewise for Anima, Ruder’s second Cello Concerto, brooding and dense, and The City in the Sea, a lugubrious setting of Poe. Anima begins with a melancholy line that soon fragments. Ruders employs a technique he’s fond of: instruments starting together but progressing at their own rates, creating dissonant canons that grow into flowing lines. The Cello Concerto also highlights another Ruders trait, a preference for colors and timbres that lie in the middle register. Michaela Fukacova keeps busy through the 23-minute work, giving energy and expression to Ruders’ continually unfolding melodic lines. It’s a charged, deeply introspective work, intense and personal. The City in the Sea is not a happy place. Moving as if in a stupor, contralto Mette Ejsing grimly perseveres through Poe’s depiction of a dying city surrounded by water. Ruders’ accompaniment is almost stifling, filled with multiple layers of melody and held chords. I hear similarities with Szymanowski, though this setting is more like a comatose Erwartung. Both the Cello Concerto and the text setting are shocking contrasts to the puckish Guitar Concerto. I’d say this disc is the best introduction to Ruders you can find. Excepting the amiable Guitar Concerto’s genial entry point, Ruders’ intensity can be daunting. This disc is volume three of Bridge’s Poul Ruders edition, probably not destined for blockbuster status, but Bridge has never taken the easy road. Heiner GOEBBELS: Eislermaterial (1998). 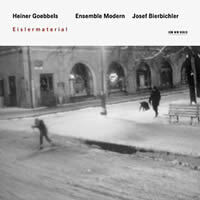 Ensemble Modern, Josef Bierbichler (voice). ECM New Series ECM 1779 (http://www.ecmrecords.com/). I’ve been on the fence about this one. After the umpteenth listen, it’s time to say why. I have trouble relating to Goebbels. His recent and popular Black on White (RCA 09026 68870 2) leaves me cold. It may be that recording renders his art less comprehensible. The wonder of Eislermaterial, Goebbels’ hour-long celebration of his idol, the leftist-revolutionary composer Hanns Eisler (1898-1962), is that Eisler and the ensemble make Goebbels look, well, not so hot. In Eislermaterial, the composer arranged and recomposed some less familiar Eisler tunes along with unpublished and incomplete works. The music passes in an unbroken stream like a medley, popular songs truncated by full-ensemble pieces, with random percussion and instrumental intrusions clouding the proceedings. There is no conductor. The players are distributed horseshoe-wise across the stage, resulting in circus-like sounds and intentional missteps in ensemble synchronization. The most enjoyable parts of Eislermaterial are those most faithful to Eisler’s originals. (Goebbels says that for some of the pieces he handed out piano scores, requiring the players to figure out their parts.) Ensemble Modern is as capable as ever, delivering edge and street smarts to these Weill-like songs and music. Josef Bierbichler, an actor, is the perfect untrained singer for what are predominantly Brecht’s texts. Lacking Eisler’s integrity, the Goebbels-directed improvising and free jazz are the music’s weakest moments. If you cut and choose, doubtless contrary to Goebbels’ wishes, you’ll find gems: The four Cradle Songs for Working Mothers are wonderful, as are those moments the whole ensemble sings — mostly men, with a female voice barely audible. Likewise gratifying are the two Hörstücke, skillfully done tape collages of Eisler speaking. He booms out from various locations, expounding, articulating, lecturing, sounding like an endearing crank. Happily, the notes provide the texts in translation. If Goebbels hadn’t discovered Eisler (his desire to study sociology had been waning), he would never have become the composer he is today. Eisler’s marriage of politics and music and his uncompromising commitment to his beliefs influenced the younger musician. I’ve heard enough Goebbels to hold me for a while. What we need is more Eisler. I’d love to know what he’d have made of this. If you’re in New York City on July 13, 2003, you can hear this same team play Eislermaterial live as part of this year’s Lincoln Center Festival (LaGuardia Concert Hall at 7:00). Check out http://www.heinergoebbels.com/ and http://www.lincolncenter.org/. Ensemble Modern is also doing Sciarrino’s opera Macbeth, July 9-12. 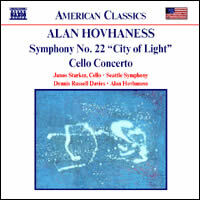 Alan HOVHANESS: Concerto for Cello and Orchestra, Op. 17 (1936); Symphony No. 22, Op. 236, “City of Light” (1971). Janos Starker (cello), Seattle Symphony, Dennis Russell Davies (cond. ), Alan Hovhaness (cond.). Naxos 8.559158 (http://www.naxos.com/). Alan HOVHANESS: Concerto No. 7 for Orchestra, Op. 119 (1953); Symphony No. 15, Op. 199, “Silver Pilgrimage” (1963); Magnificat, Op. 157 (1957). The Louisville Orchestra, Robert S. Whitney (cond.). First Edition Music FECD-0006 (http://www.firsteditionmusic.com/). 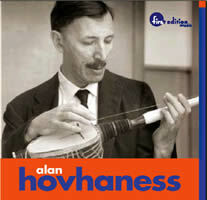 A La Folia colleague was astounded to hear that I was writing about Alan Hovhaness. Good music in good performances is always worth a few paragraphs. Hovhaness is one of the 20th century’s more underrated composers. With opus numbers in the 400s and 67 numbered symphonies, his prolificacy suggests inconsistent quality. A compositional technique combining modes, counterpoint, and non-Western music discourages some from taking him seriously. You won’t find him in Boulez’s repertoire, for example. The composer’s reputation has also been hurt by an abundance of inferior recordings. Born in 1911 to Scottish and Armenian parents, Hovhaness bridged different worlds from birth. As he developed his musical style, he was one of the first composers to express spirituality, Eastern music and philosophy, not to neglect nature, thus predating Lou Harrison, John Tavener, Arvo Pärt and others. He was also an innovator. Aleatoric elements appear in his work as early as the 1940s, and some of his music includes taped sounds, e.g., And God Created Great Whales from 1970, a popular work which Hovhaness apparently regretted writing. Two recent discs offer evidence of Hovhaness’ depth. Naxos pairs an excellent world-premiere recording with a reissue from one of Delos’ many Hovhaness releases, with First Edition Records reissuing the Louisville Orchestra’s legendary recordings. Whether new to Hovhaness or a fan, you will find the Naxos disc with the Concerto for Cello and Orchestra and Symphony No. 22 essential listening. Cello soloist Janos Starker’s expressive playing argues well that this concerto should be brought into the repertoire. Hovhaness was but 25 when he wrote it, and many hallmarks of his style are in force: modal melodies, intermittent flourishes from the brass or percussion section, and a contemplative and serene tone. The three movements’ odd proportions (15:56, 3:27 and 11:40) are indicative of the concerto’s idiosyncrasies. The cello, like a cantor or muezzin, sings broadly over a transparent accompaniment. The solo instrument is most often paired with winds, as in the first movement, which opens with a solo flute. It’s a remarkable composition and Starker and the Seattle Symphony play majestically. This is the concerto’s first recording, and quite a coup for all involved. The four-movement Symphony No. 22, conducted by Hovhaness himself, opens with a stately Allegro moderato. Just before the five-minute mark the strings embark on a luscious section of fortissimo cadential sequences that could pass for late Nielsen or Robert Simpson. The symphony’s two inner movements, a Largo titled “Angel of Light” and a song-like Allegretto, are the shortest, operating as stepping stones to the larger bookend movements. The Finale returns to solemnity with sweeping orchestral outbursts leading to an extended fugue initiated by the strings. The symphony does have some incongruous moments: The tunes in the third movement are Asian, whereas a repeated phrase in the introduction to the Finale’s fugue could have come from Smetana’s Má vlast. The Seattle Symphony plays with winsome dedication. It’s great that First Edition Records has teamed up with the Louisville Orchestra to bring back some of their recordings. As a welcome contrast to the original LPs’ nondescript covers, colorful graphics and extensive notes complement the Louisville’s historic releases of first recordings and commissioned works. Whether or not you liked the music, the Louisville Orchestra gave it their all. Concerto No. 7 makes use of the Hindustani bhairavi mode, a scale similar to the Phyrigian mode. The opening high winds and shimmering percussion lead to a rambunctious and grand brass chorale. In the decidedly ethnic second movement, pizzicato strings run up and down the scale in support of a traditional Hindustani melodic figure called a jhala. The last movement is a series of canons culminating in a heroic hymn. Moving ahead ten years, Symphony No. 15 is cut from similar cloth. The first of four movements uses but six pitches and is an exotic picture of a mountain. Murmuring strings and a timpani gesture that repeats every 19 beats form the background for a grand and slow-moving melody in the low strings. With a lighter tune in the violins, the second movement also keeps to six pitches. After some introductory chords and atmospheric recollections of the preceding two movements, the third graduates to seven pitches with a dominant flute solo whose pitch-bending is more Japanese than Indian. The last movement is a hymn in which all 12 chromatic pitches are fair game. A solo trumpet leads the evenly flowing canonic hymn as the orchestra swells and recedes. Whatever you may say of these pieces, Hovhaness orchestrates confidently and the music moves briskly and efficiently. Most importantly, the Louisville Orchestra plays with a respect and conviction other ensembles might not be able to muster, given the music’s apparent simplicity. Their energy makes up for the blunt mono sound and omnipresent hiss of this 1954 recording. The opening movement of the symphony, recorded in 1965 in stereo, has the listener sitting in the violin section. The Magnificat is a different story. Taped in 1961, the solo voices and orchestra are excruciatingly unbalanced in weak-kneed mono. Call me inconsistent, but while the concerto and symphony have merits, the Magnificat sounds like a student effort or the backdrop of a B-grade movie — something tawdry and religious, set in Morocco. The final Gloria with its suggestions of Renaissance modes is downright embarrassing. Maybe I’ve missed the point. Hovhaness’ use of Latin texts is to say the least peculiar, given his predilection for non-European harmonies and modes. Still, good recordings of Hovhaness are rare: Concerto No. 7 and Symphony No. 15 on First Edition Records make for an appealing release, but the Naxos with the Cello Concerto and Symphony No. 22 is required.